A slight Greek exaggeration? | The British in Crete, 1896 to 1913. The Ottoman watch tower at Voukoulies, covering the route from Canea to the south west of Crete, fell to a Greek force consisting of Greek army troops and Cretan Christian irregulars, on the night of 6/7 February 1897. The illustration above (date and provenance unknown) somewhat exaggerates the events, in reality, the Ottoman forces lost somewhere in the region of 35 men killed, the Greek army one man killed and two wounded. The Cretan Christians, fighting rather ineffectively along side the Greek army, lost up to 30 men killed. Of particular note in the illustration are the European ships in the background. While artistic license has been used, the sea is not visible from Voukoulies, the presence of European naval forces acted as a serious deterrence to Greek/Cretan Christian ambitions. 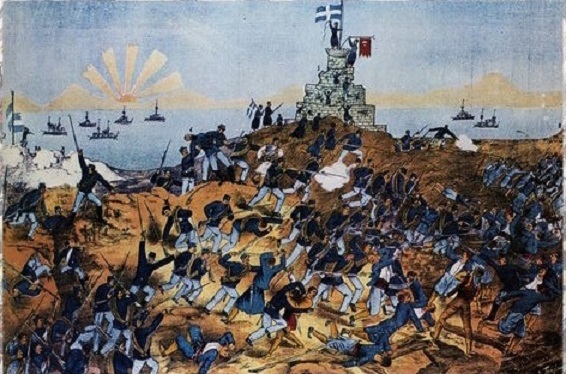 Only when the European navies were out of range, as on this occasion, were the Greeks and Cretan Christians able to overpower Ottoman held positions. The reliance on on naval power in the early days of the European intervention, in particular in the British secteur of the island, was made clear to commander of the British land forces, Major General Chermside, who was instructed by the Council of Admirals, the de facto rulers of the island from from February 1897 until the arrival of Prince George in December 1898, not to attempt to base his men beyond the range of the heavy guns on British warships. This entry was posted in Cretan Rebels, Greek Army in Crete and tagged Cretan Christians, Crete 1897, Greek army on February 14, 2015 by Mick McT.